New Delhi: Dr Dharminder Nagar, Managing Director and CEO, Paras Group has won the prestigious ‘Healthcare Entrepreneur of the Year’ award at the recently held India News Health Awards (ITV Network). Mr Jagat Prakash Nadda, Union Minister of Health and Family Welfare, Government of India handed over the award to Dr Nagar at a glittering award ceremony held in the national capital. 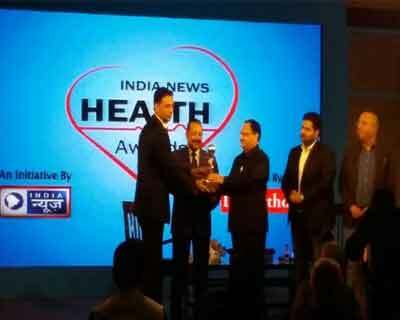 India News Health Awards recognizes doctors and professionals from the health and healthcare industry who have worked tirelessly and contributed in an exemplary manner to achieve excellence in their field of expertise. At the grand event held in the national capital, awards were given out in 19 categories, recognizing the contributions of people associated with healthcare industry in India. Reputed medical practitioners, dignitaries, and celebrities were a part of the event. “I am extremely happy and proud to receive this award which validates my team’s contribution and sincere efforts towards improving the healthcare ecosystem in India. I would like to underline here that being listed among the torchbearers of excellence and leadership in healthcare is not an easy task, and all such recognitions are attributable to a team effort. I personally thank the jury who have recognized our contribution and honored me with this prestigious award,” said Dr Nagar. Dr Nagar’s vision of leadership in healthcare is aligned to his belief that every Indian must have the right to avail healthcare. His vision is to make quality healthcare affordable and accessible to all. In a medical career spanning over two decades, he has assumed several administrational and entrepreneurial roles in the healthcare industry and is presently leading the Paras Healthcare Chain. After completing MS from Imperial College, London and MBA from Harvard, Dr Nagar returned to his roots India to follow an entirely different path from his peers, that of an entrepreneur. His objective was to establish highest standard of quality healthcare within the country that is affordable and accessible to all. Going forward with the tenets of affordability, accessibility and quality in healthcare, Dr Nagar created the road map for Paras Healthcare, which is one of the country’s leading healthcare service providers and has under its wings the significant verticals including Paras Hospitals (the chain of multi super specialty hospitals), Paras Bliss (chain of mother and child care hospitals) and Paras Cancer Centre (chain of specialized cancer care centers). India’s healthcare sector is expected to be USD 280 billion in size by 2020 and is growing at a CAGR of 16% year-on-year. Since its inception, Paras Group under the steward leadership of Dr Nagar, has been taking proactive steps to provide right personnel at the right place and time in a bid to make healthcare services affordable and accessible to every citizen.